I managed to see ten different shows in a two-week period and I love it! There’s not much new going on this week (Showbiz Player’s marijuana comedy, REEFER MADNESS, opens at The Carnegie on Friday), but six of the ones I saw are still up and running. So today I thought I’d recap them and give you some informed choices for your own viewing. Here goes nothing. 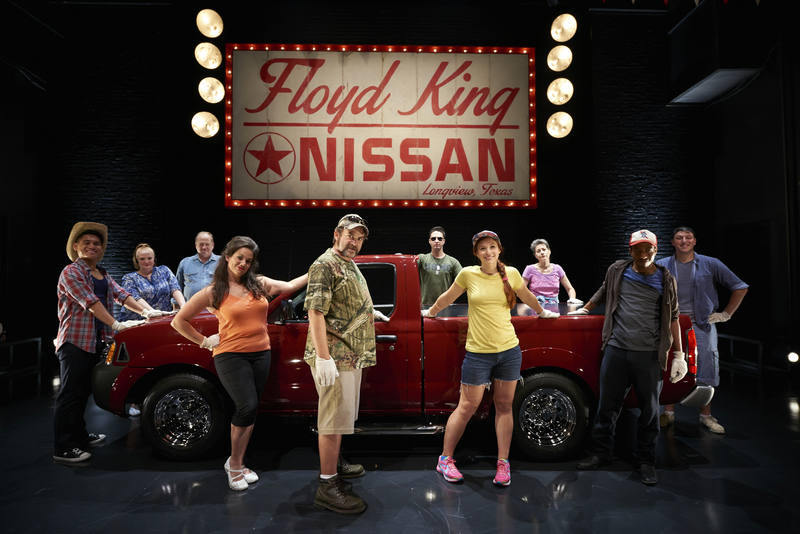 Wrapping up on Sunday night is the based-on-real-life musical, HANDS ON A HARDBODY at Ensemble Theatre in Cincinnati. This story about a group of contestants trying to win a truck in the hot Texas sun is inspiring, with its message to never let go of something that matters. 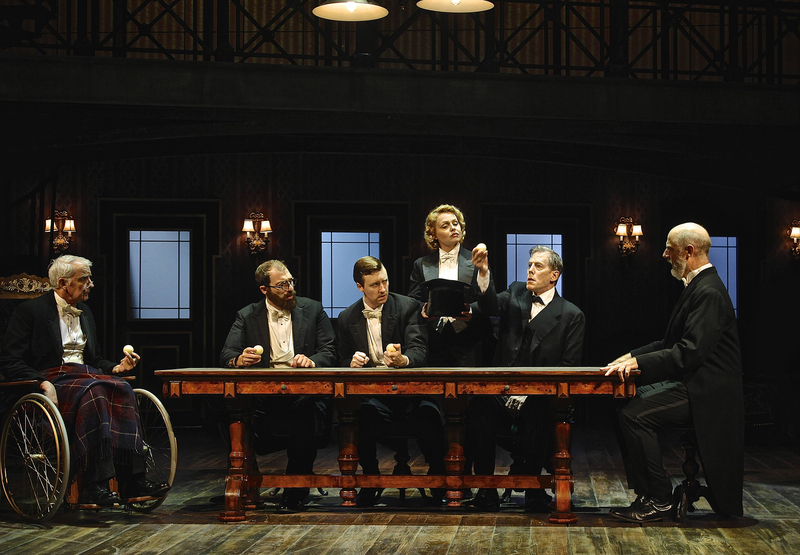 The performances are the highlight of this one, especially those of Charlie Clark, Sara Mackie, Denise Devlin, Dallas Padoven, and Phil Fiorini. WHO SHOULD SEE IT: fans of contemporary musicals, people who like trucks, and anyone who needs a little rockabilly infused hope and joy in their life. Click here for more info. I’m actually going back for the Sunday matinée. Also closing this week is the uproarious comedy, MIRACLE ON SOUTH DIVISION STREET, at The Human Race Theatre Company in downtown Dayton. The Novac family has a shrine to the Virgin Mother that used to be a major tourist attraction . . . but business has slowed down and the miracles the statue performed are few and far between. In the midst of trying to boost business, some family secrets unravel to delightful results. 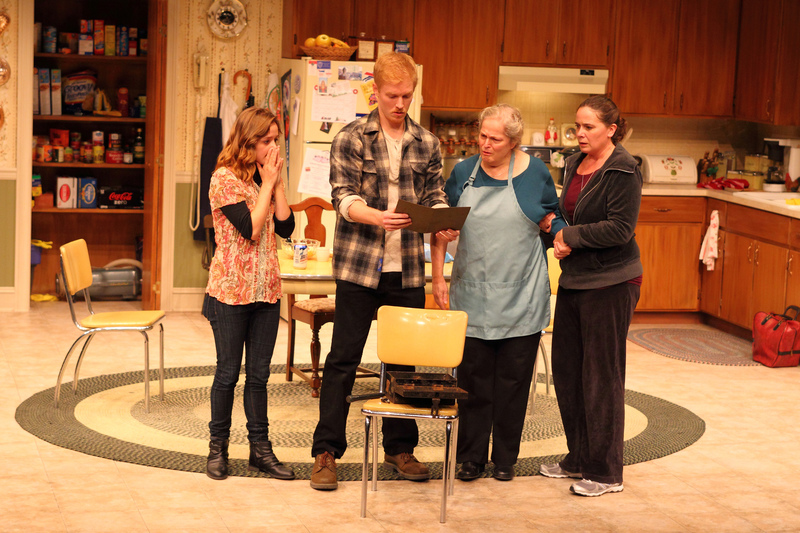 This is a very funny play about religion, family, and how learning about where we come from can change us forever. Speaking of families, The Clifton Players’ THE RIVERSIDE is all about family. And baseball. And drinking. And Mt. Adams. I was personally impressed by the acting, the set, and am always thrilled to see a show in this intimate space. What an ensemble! This one runs through September 27th and shows here are usually a hot ticket. Don’t hesitate to get yours now by clicking here. 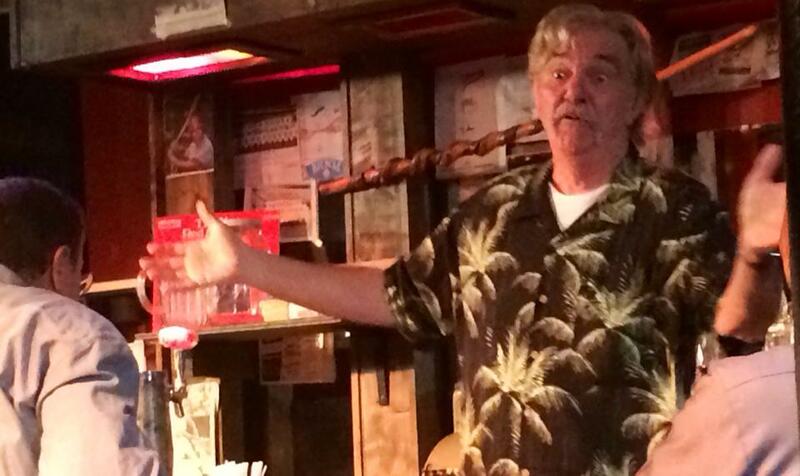 WHO SHOULD SEE IT: Cincinnatians, Pete Rose fans, alcoholics and their families, anyone who wants to see a Master Class in acting by Daniel Britt, Gary McGurk, Christine Dye, Mindy Heithaus, or Michael Shooner (and the rest of the company). Speaking of Mt. 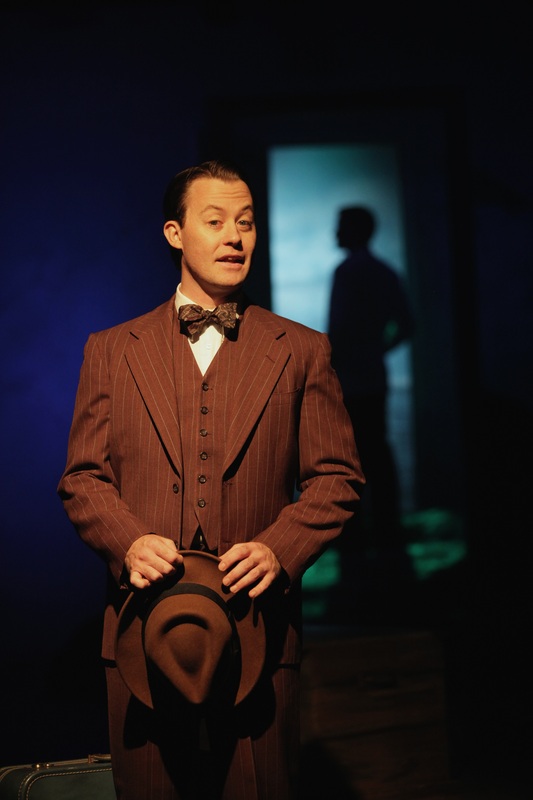 Adams, Cincinnati Playhouse in the Park is currently producing SHERLOCK HOLMES AND THE ADVENTURE OF THE SUICIDE CLUB. This old-fashioned whodunit brings the best of Sherlock to an original story by Robert Louis Stevenson. Its full of danger, intrigue, and sharp humor. I enjoyed it a lot and you will too. It runs through October 4th and tickets can be found here. They’re also doing some school matinees, so if your student is lucky, perhaps they’ll also get to see it. Click here for more information, including tickets. Gatsby runs through October 4th. WHO SHOULD SEE IT: Fans of the book, fans of the movie, people who’ve never seen the book or the movie, theatre techies, emotional saps like me. 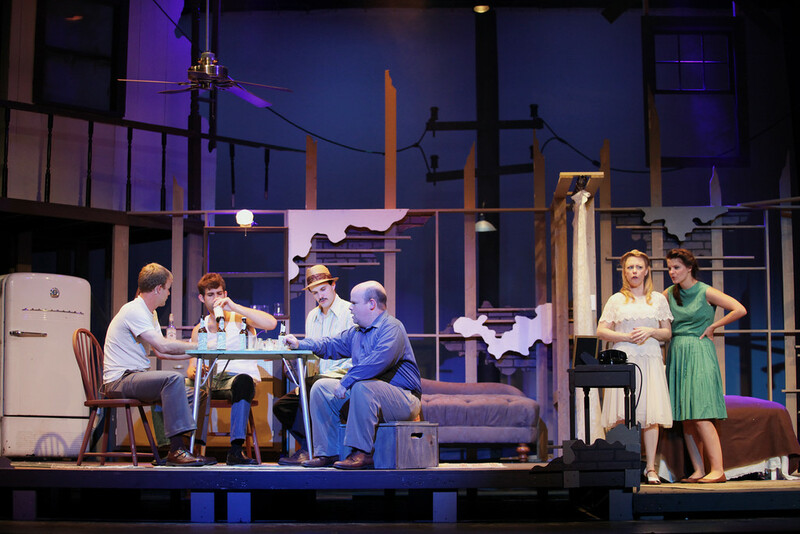 And finally, I strongly urge you to check out the Covedale Center’s wonderful production of A STREETCAR NAMED DESIRE. This is a terrific show, written in 1947, but full of relationships that are as relevant today as they were then. I can’t say enough nice things about the entire play, especially the phenomenal acting by Kim Long, Mike Hall, Cliff Nunley, and Maggie Lou Rader. The show runs through October 5th. Tickets can be found here. It’s my must-see pick of the week. WHO SHOULD SEE IT: Westsiders, Eastsiders, Northsiders, Southsiders, fans of classic theatre, and pretty much anyone with a pulse (age appropriate, of course). So, you’ve got six terrific options for this weekend (see them all on our calendar), plus REEFER MADNESS, and some community theatre productions (find them all at Rob Bucher’s Behind the Curtain Cincinnati web site). There’s no excuse not to get out to the theatre and see one or two . . . and there are even affordable options (like half price rush tickets at Ensemble, for example). So . . . what are you doing to support Cincinnati theatre this week? P.S. Friday night I’ll be at Halloween Haunt at Kings Island. Some experiential theatre for horror fans, there, eh? Plus the return of a great monster-themed musical revue, Ghouls Gone Wild, an acrobatic spectacle called Skeleton Crew, and a percussion production called Blood Drums. Its a fun time and just another opportunity to support local performers!